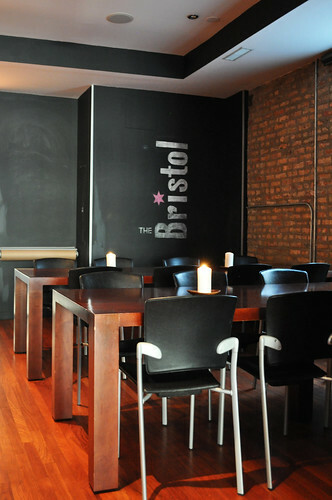 Our other culinary adventure whilst in Chicago was at The Bristol over in Bucktown. We met up with Andrew, a close friend of mine from high school who moved to Chi-Town three years ago. 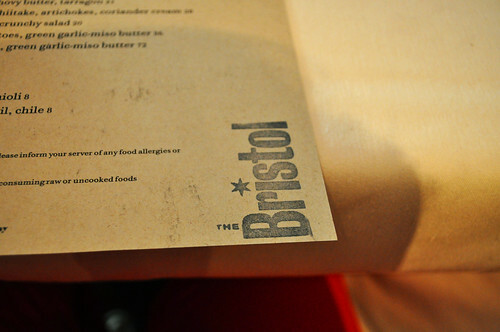 The Bristol has been on my list of places to check out for the past two years. 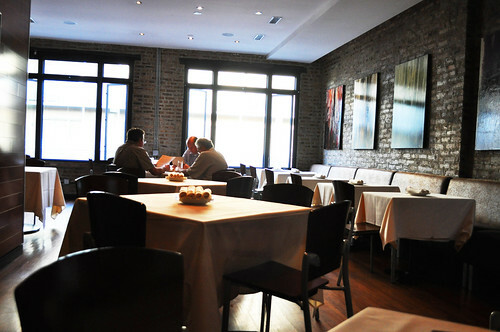 I first heard about it through Alan Richman's "Ten Best New Restaurants in America" list for GQ in 2010. The disclosed photograph was what first enticed me -- gotta love the organic feeling of the warm woods with the chalkboard backdrop. The décor is dictated by a blackboard menu, metal chairs, Edison-style light bulbs, exposed brick walls, and tables sans tablecloth. We were seated on the second level of the restaurant, where it's a little more dressed up (but no less casual). The artwork on the walls of exposed brick, i.e., acrylic paint on wood featuring mostly trees, is by Evie Ogborn, a local artist. Chef Chris Pendel is the mastermind behind The Bristol (both co-owner and executive chef). Star Chefs describes him best as "everything that connotes Midwestern charm (i.e., effusive goodwill and a love of community, coupled with a killer work ethic)" and his food as "rooted in classic French technique and mostly local Midwestern ingredient that are unfussy and hearty and at the same time fresh, clean, and elegant." Chef Pandel began his career at a restaurant in his hometown of Riverside, Illinois, followed by a job at Courtright's in Willow Springs. He then attended Johnson & Wales University, during which he found himself interning at Tru under Chef Rick Tramonto. Upon graduating JWU, Chef Pandel spent what he calls "graduate school" in New York City at Café Boulud under Chef Andrew Carmellini. His love of the Midwest brought him back to Chicago (and back to Tru) where he eventually became the corporate chef at three Tramonto restaurants. He has said that Chef Carmellini "molded him into a cook" and that under Chef Tramonto, he "earned a 'sense of self' in the kitchen and the know-how to run a business." 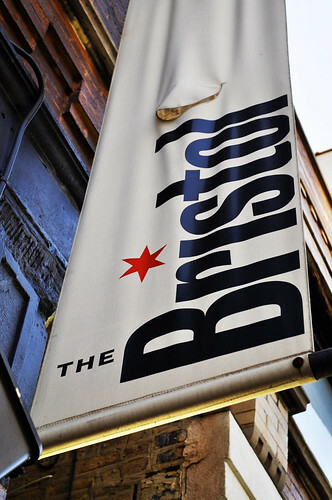 In 2008, he opened The Bristol with partners John Ross and Phillip Waters, where its "communal tables encourage conviviality" and his "cooking follows through with just the right blend of comfort and creativity" and rooted in Mediterranean cuisine. While the cuisine is New American, the menu's focus locavorian and artisanal with shameless offering of offal, innards, and oddities. In fact, The Bristol butchers whole animals in-house, meaning "offal and charcuterie are regulars ont he menu, and roast chicken might show up with foot and claw attached." 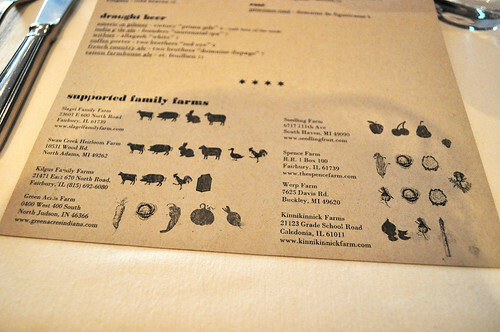 The menu even includes a complete list of the local purveyors and farms from where the kitchen sources its ingredients. First order of business was to order the duck fat fries with house ketchup and garlic aioli from the snack portion of the menu. The perfect shoestring fries, in all of their salty golden glory, were great, especially with the housemade condiments at their side. Definitely order these for the table to share -- I promise there won't be any left! 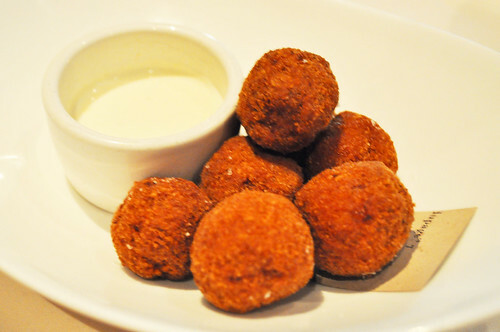 Andrew also ordered the scotch olives with pork sausage and lemon crème fraîche. Nice little bites of savory and briny flavors, and considering I'm not a fan of olives, this was quite appetizing. We also ordered the crispy flatbread with bacon lardons, caramelized onions, and ricotta (I think?) to share. 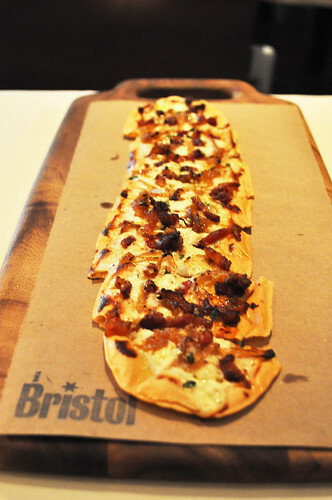 It certainly reminded me of the tarte flambée I had at The Bar Room at The Modern -- only this flatbread from The Bristol was oblong and had a more American-rustic style to it (as opposed to the Alsatian-style one by The Modern). Another delectable starter to share with the table -- warm, crisp, and savory. Just goes to show how bacon (especially those li'l lardons) makes everything better. The Bristol proved the following to be true once again: chances are if there is bone marrow on a given restaurant's menu that it will soon make an appearance at my dining table. 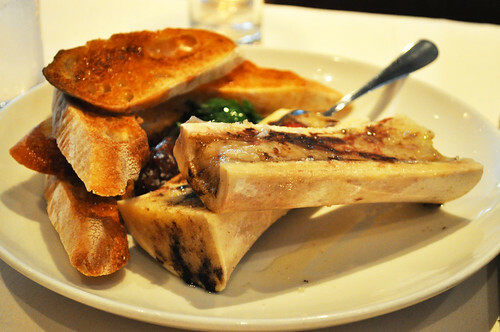 It was one of the specials offered that evening -- roasted bone marrow with shallot jam, parsley salad, and sea salt. The marrow bones were cut and served lengthwise -- certainly a striking presentation for those who are not totally immersed in offal and the like. I didn't mind one bit -- I was the first one scooping away at the marrow! I spread a good chunk of marrow onto the toasted crostini, topping it with a generous dollop of shallot marmalade (some seriously wonderful stuff) and leaves of parsley. The bone marrow was just divine -- the shallot marmalade is the ideal solution for those who are averse to raw allium genus vegetables like shallots and onions. You still get the desired flavor effect of the shallot without the pungent and biting raw juiciness from its bulb flesh. Definitely need to find a recipe for the marmalade! 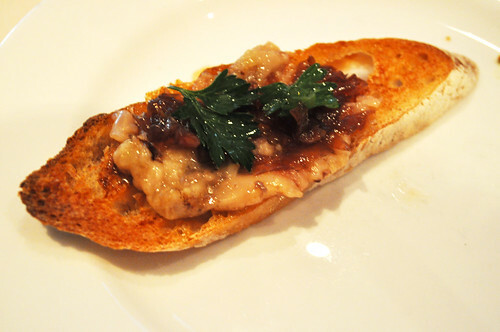 However, the course would have been that much better if the crostini was a little looser in its toastedness (it seemed harder than the texture of crouton cubes), allowing for the bites into it to give a little bit. More crostini would have also made this an even more winning dish, especially for a ratio eater like myself. I had the raviolo with ricotta, egg yolk, and brown butter as my main course. While overall this was pretty good, I was hoping for a more "melty" raviolo -- the kind where the pasta shell melts right into the creamy ricotta/egg yolk/brown butter interior. I found the pasta to be on the thicker side, and overall, the dish arrived just barely warmed, as if it had been sitting out waiting. The ricotta had an okay consistency (thick and crumble), though I would have preferred a creamier mesh with the runny egg yolk and brown butter. 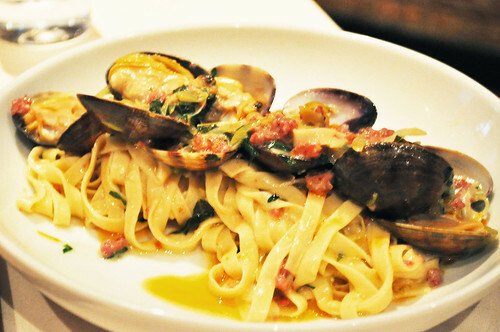 Marcus had the linguine with clams, andouille, olive oil, and chile. This was really, really good -- a lovely combination of clams, spicy sausage, flavorful olive oil, and punchy chiles. Marcus had a diminished appetite as a result of his medication (boo! ), but that meant I had the leftovers for breakfast the next morning -- still delicious even then! 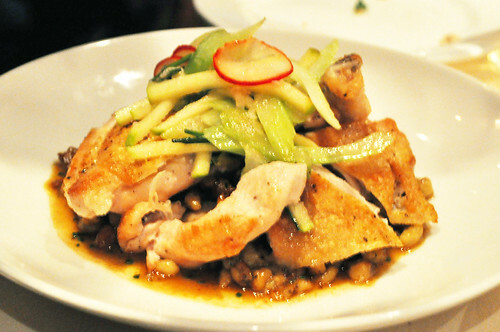 Andrew went with the roasted half chicken with dill spaetzel and crunchy salad, a classic/signature dish at The Bristol. While I didn't steal a bite (now wishing that I had! ), he reported that it was a really well-roasted chicken and very tasty. So if you're not feeling too adventurous at The Bristol, this is up any omnivore's alley! For dessert, Marcus and I ordered chocolate sabayon with nutterbutters. It pretty much a mandatory thing for Marcus as it came with nutterbutters. 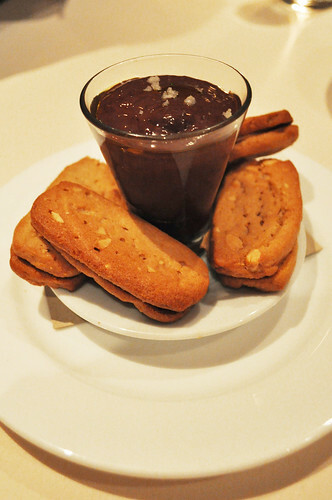 Taste-wise, the homemade nutterbutters were delicious, but texture-wise, it was kinda hard. The chocolate sabayon was also heavier than I expected -- it was more like a pudding than a sabayon, which is supposed to be a light, foamy custard-like dessert. This wasn't necessarily a bad thing, but I was certainly expecting something lighter than was served. Andrew opted for the cheesecake with figs and honey. 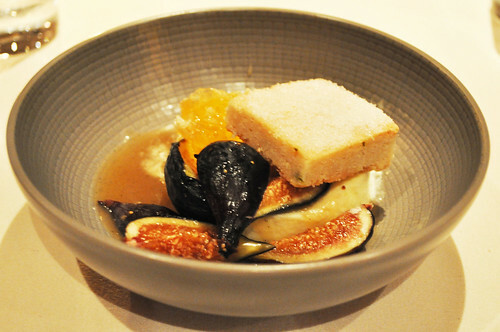 It was pretty good, but the element of this dessert that was calling my name were the figs. However, the cheesecake was a different story. 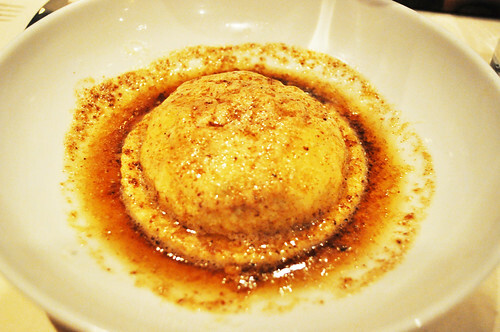 Just like how I felt with the ricotta in my raviolo, I felt like this cheesecake wasn't very fluffy or creamy. Findings: Overall, The Bristol was fun, especially with its interior design and communal-driven snacks/starters. The atmosphere is certainly energetic, and the menu provides some interesting nomming navigation. 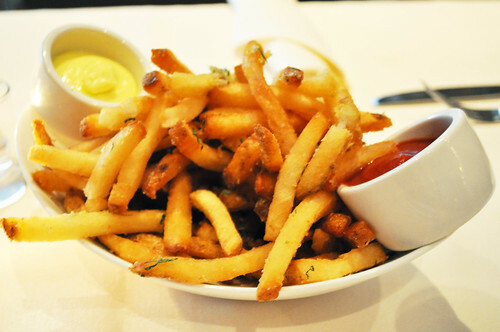 Must orders have to be the duck fat fries (need I say more?! ), the crispy flatbread (who can say no to bacon lardons?! ), the bone marrow (yay for shallot marmalade), the roasted half-chicken, and that linguine if it's on the menu that day! I would deem this spot more appropriate for catching up with friends over drinks and snacks. The main courses and dessert can be hit or miss, especially from what we observed, so just tread carefully. Price point: $7 for each snack, $12-13 for each starter, $12-14 for each pasta, $20 for the main, $8 for each dessert.